Extracting all the juice out of your produce; Is there juice left in the pulp? Are you getting all the juice out of your pulp? Have you ever picked up the pulp that has come out of your juicer and squeezed it? Ever notice that its still wet? Many juicers today are built for speed, ease of cleaning and the ability to juice a wide variety of produce. Unfortunately, they do not always extract all the juice out of the produce, and can leave juice in the pulp. Luckily, if you own a masticating, single auger, or twin gear juicer, you can run the pulp back through the machine for further extraction, and will get a higher yield. This can be done multiple times, although there is a point of diminishing returns. If you own a Centrifugal or Centrifugal Ejection, the pulp will not effectively be juiced if you run it back through the machine. So you may be thinking, what can I do to get the juice out? With a manual press, you can press out the remaining juice out of the pulp. The resulting pulp will be very dry. 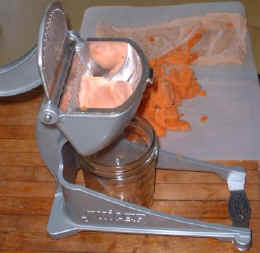 In my test, I used a Lequip Mini 110.5 centrifugal ejection juicer to juice 2 pounds of Bunny Luv organic baby carrots (approx. $3.00). This juicer produced a little over 16 ounces of juice. This is about the average yield when juicing carrots. I would think of it as an acceptable yield for an ejection juicer. Taking the pulp created by the Lequip mini,I placed it into the press bags, and pressed it with Ito juice press. It took about 6 individual pressing sessions to press all the pulp. I was rewarded with 6 ounces of pure juice (no pulp - very smooth and tastes great!). My favorite juice has always been pressed juice. According to my calculations, this is 37.5% more juice! Keep in mind for something like fruits, this figure would be much more, since most fruits (especially softer ones - such as berries) don't yield too much in conventional electric juicers. Given the chart above, you can see, I would have been "throwing away" $1.72 in juice based on the .1875 cents an ounce. When factoring in the extra juice extracted from the pulp, it lowers the overall cost to .1363 cents an ounce. I hope you have learned about how much money (and extra juice) you may be throwing away after every juicing session. Jeez.. I wish I had this press when I first started juicing... I was juicing 5 pounds of carrots a day!! Think of all that extra juice! Click here for further information and articles.